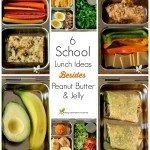 School snack time can be both nourishing and quick prep with these great packable snack ideas! I have a bit of a love hate relationship with school snack time. On the one hand, a school morning is really long for those little guys in preschool and early elementary school. Most of them have breakfast quite early and to make it from 7:30am until noon or so without eating is a long time to go without re-fueling. Even if those little ones are eating a nice nutrient dense breakfast, going 5 hours without eating isn’t going to work for growing bodies. On the other hand…I have had my share of bringing home a preschooler that hardly eats their noon time lunch because they had a school time snack. 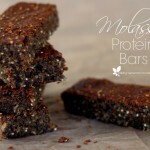 So in the last few years of having little ones in preschool and early elementary school, I have come up with a happy medium method to snack time that keeps the kids fueled to make it through the morning, as well as nourish them with something you can feel good about. My goal in feeding little kids has always been “make every bite count”. Every meal and snack has a purpose. That might seem “deep” for talking about food. But those little tummies don’t always hold very much. Filling them up on something unsubstantial like fish crackers isn’t doing them any growth good. Think about those rapidly growing brains, their synapses, and also a child’s rapidly growing body. Fueling the brain with friendly fats as well as the body with some carbohydrate energy is vital to keep happy moods and balanced systems. So what about the provided school snack? Most preschools and some elementary schools provide a snack and I just pack my own. There will be different rules at different schools, but I have found that being as non-threatening and non-confrontational as possible, as well as “kindly confident” has worked for me. Between my 2 oldest girls, I have now been through 4 different preschool systems, 1 elementary school, and a handful of church situations. All of the school and church systems have a provided a snack, and none of them have had a problem with me packing my daughter’s snacks. We have had a couple of years of a room with severe peanut allergy as well as egg and gluten that can’t even be in the same room. In those cases you just adjust the snacks to the allergens and I have always been fine. In the severe peanut allergy case I gave a list of snacks I would be packing to the mom and we talked about the ingredient lists and that was that. A little extra work but do able. In my opinion it was better than having my daughter fed fish crackers or Fruit Loops (yes this is actually a routine snack given!) every preschool morning. But what about the time?! Hear me on this one…I make 3 meals a day. Barely. Usually at least one of those 3 meals of the day is leftovers that are warmed through. Honestly I don’t have time to be making elaborate and fancy little snacks every school day. I want quick prep and easily packable. 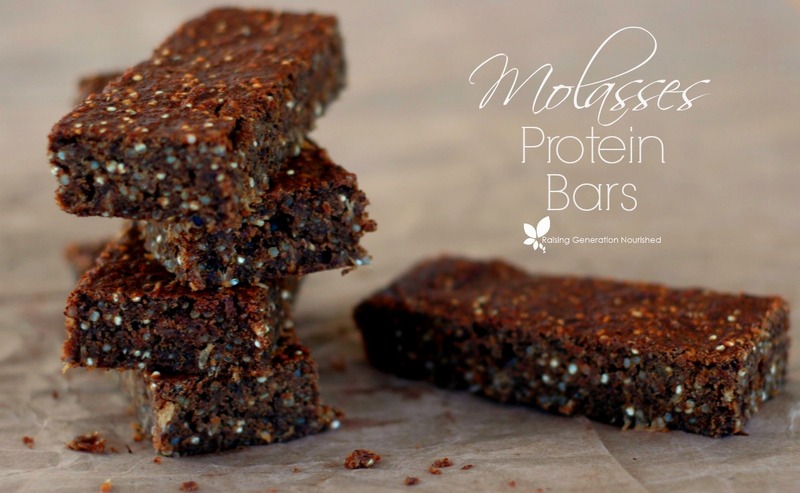 So these have been my go-to packable snacks that are also fast prep and nutrient dense – that is quite a tall order and it really is do-able! These snack ideas are meant to be your inspiration. To get the wheels turning. If you eat differently in your family change things up! And fix the portion sizes to your kids appetites. Every kid is so different, and different from every other kid that age. Older kids may need more than what is pictured here, and early preschoolers might need less. Do what works for your little one. 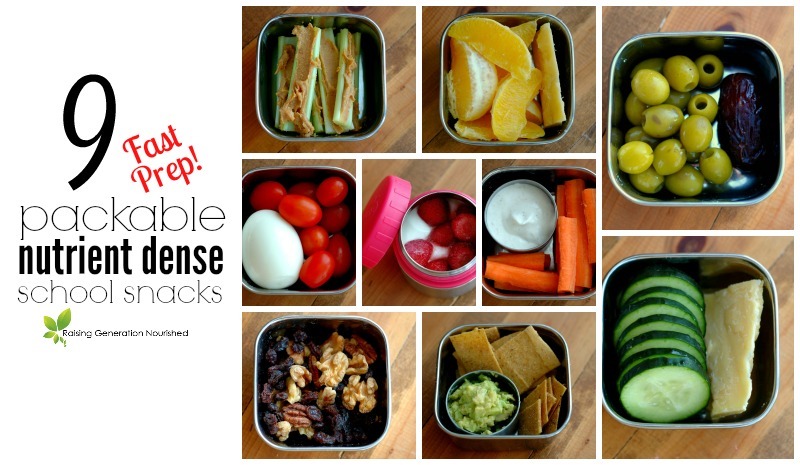 My favorite snack time packing gear! Small stainless steel containers with lids. I have these square containers and round containers that work well. Condiment containers for dips. The LunchBots condiment containers fits well in the 2 containers above. They will also grow with your child and be able to be used for elementary school lunches as they fit in just about any bento box. 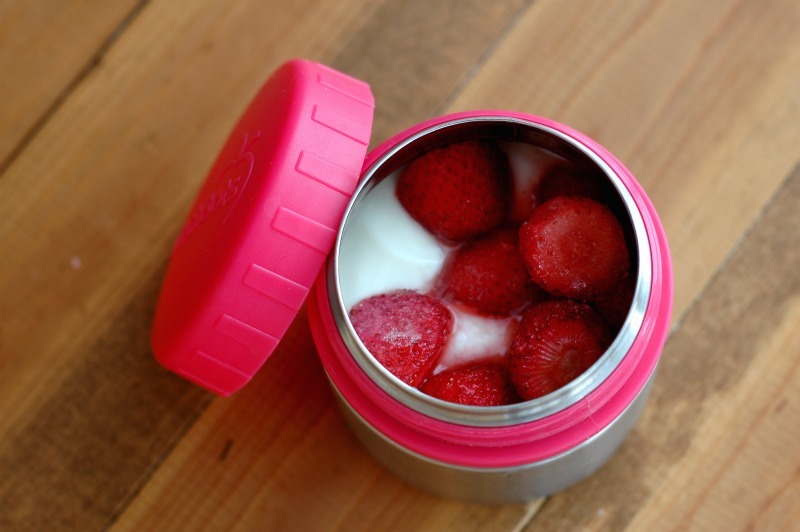 LunchBots “Rounds” containers for yogurt or otherwise liquid-y snacks. This is another one that will grow with your child as I use them weekly for my oldest daughter’s school lunches for yogurt, applesauce, etc. I also really like the PlanetBox “Shuttle” snack container, which is a little on the big side for these small snacks, but I use them ALL the time in the spring and summer for packing snacks for all 3 of my girls and even some smaller lunches. **Update 2017 :: We picked up these Kid Basix snack containers with attached lids that I am really loving – the lids are sturdy (and attached!). I have the small size for my current preschooler, and my older 2 girls have been using the medium size for their morning snack at school. Ok! Onto some details for those snacks! 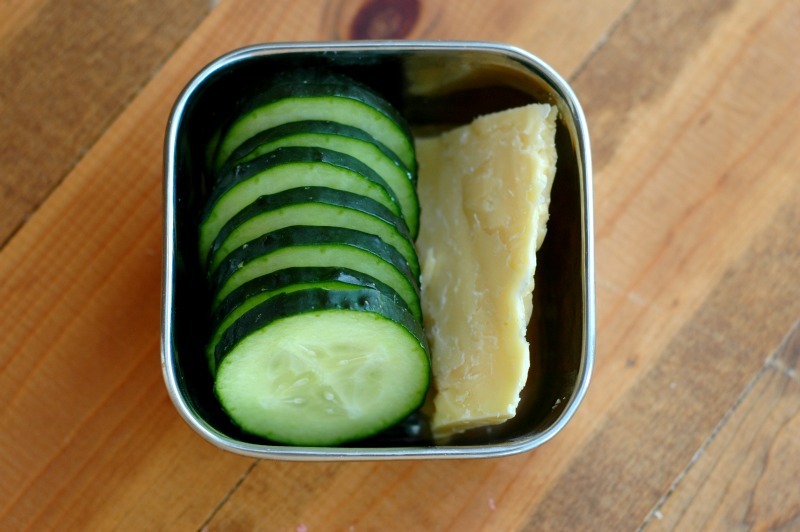 Cucumbers and Cream Cheese or Raw Cheese: These are fun to make little sandwiches with or just eat side by side. 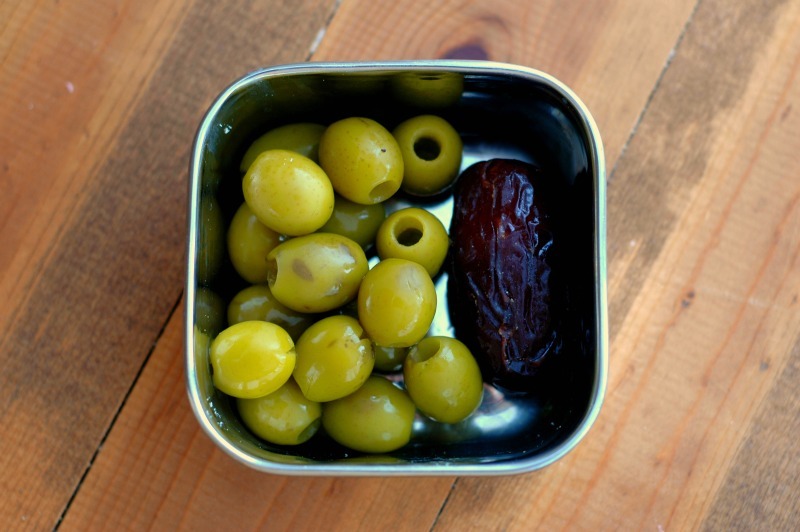 Olives and a Date: Olives are a great source of fat and dates of energy and minerals. 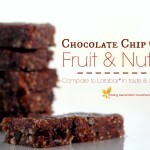 It is a really great, light snack and one my girls ask for often. 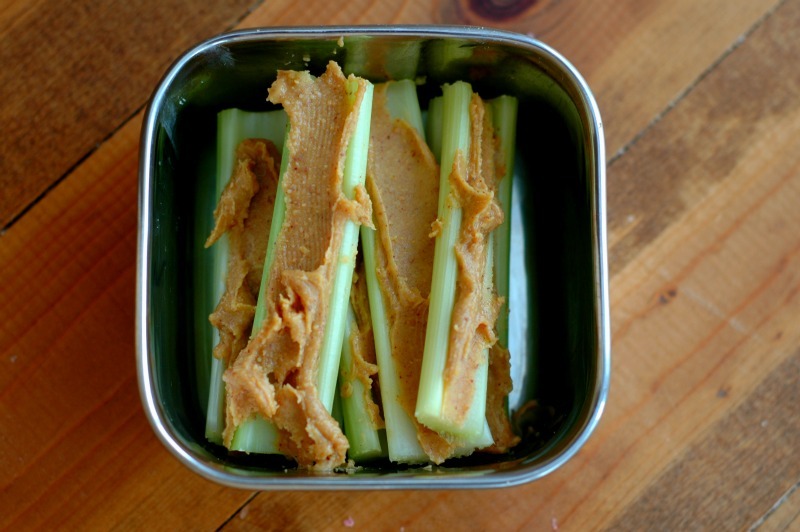 Celery with Nut or Seed Butter: Just check for the tree nut allergies in the room – most kiddos with the tree nut allergies can have SunButter (sunflower seed butter) in the room. If they cannot have the seed butter in the room either, then we like to use coconut butter (sometimes called coconut manna) on the celery instead. Fruit On The Bottom Yogurt: I love these little “Rounds” containers – I use them for snacks for my preschooler, and also in lunches for my oldest. They fit the perfect amount of yogurt and you can top it with fruit from the freezer or your own granola. We do this snack often. Add a drizzle of raw honey or pure maple syrup if your kids are used to the typical sweetness of commercial fruit on the bottom yogurt cups. 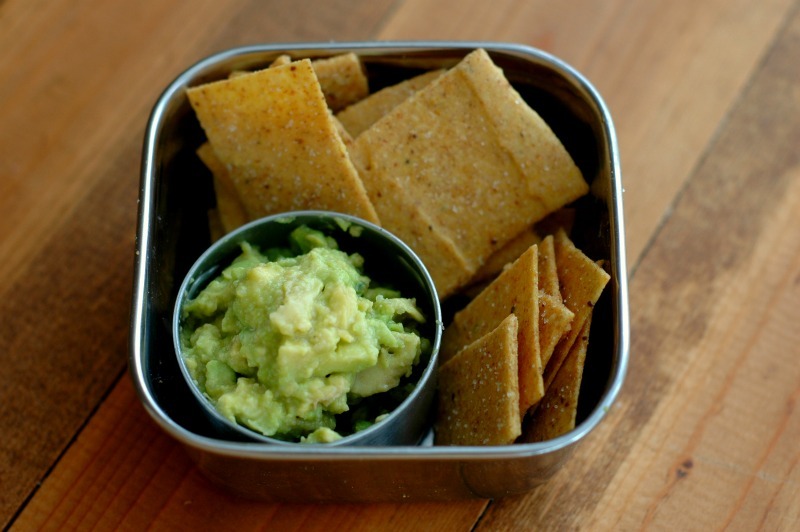 Crackers with Guacamole or Hummus: I usually make these quick plantain crackers or simple GF crackers every weekend that work well for this – they are so crispy and delicious. But there is nothing wrong with getting a quality non-junky cracker from the store like the Mary’s Gone Crackers . My kids like this kid friendly guacamole, and I make hummus occasionally. I think store bought is fine too in a pinch by the way. 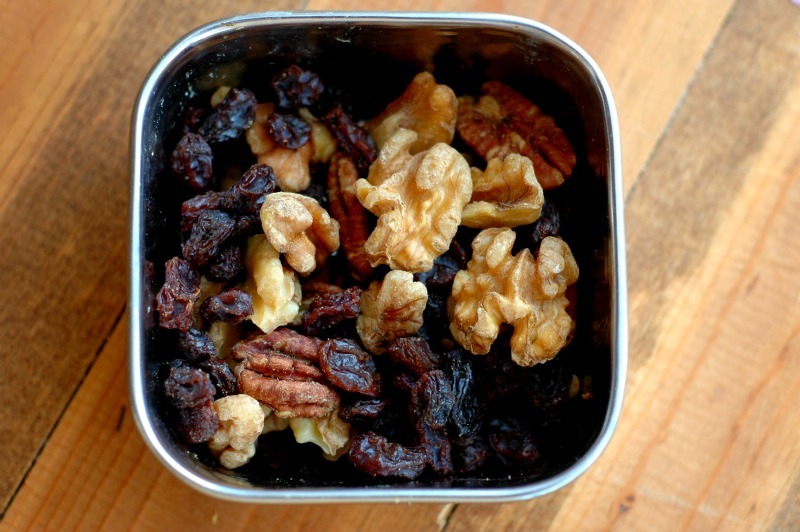 Crispy Nuts or Seeds & Dried Fruit Trailmix: Do roasted pumpkin seeds or sunflower seeds if there is a nut allergy in the room. If nuts and seeds are not allowed in the room do coconut flakes or toasted coconut chips and dried fruit! 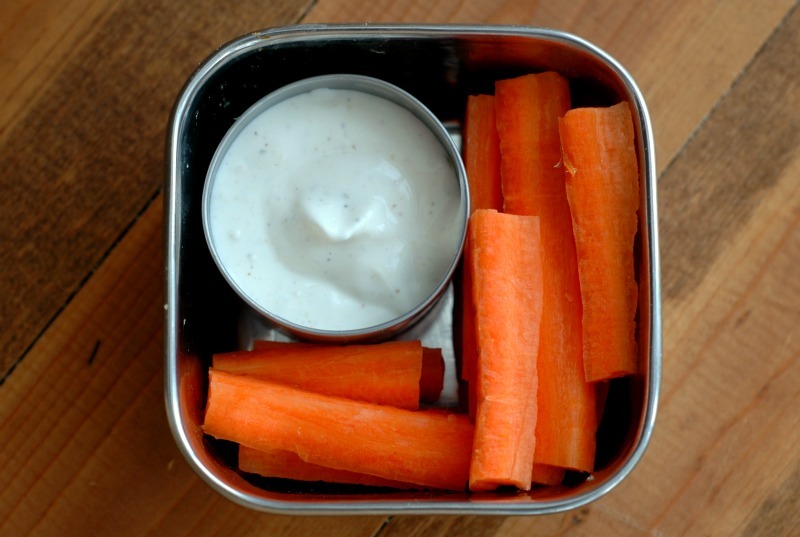 Veggies & 5 Minute Ranch or Paleo Ranch: Some of our favorites are carrot sticks, sugar pea pods, celery sticks, cherry tomatoes, bell peppers, etc. 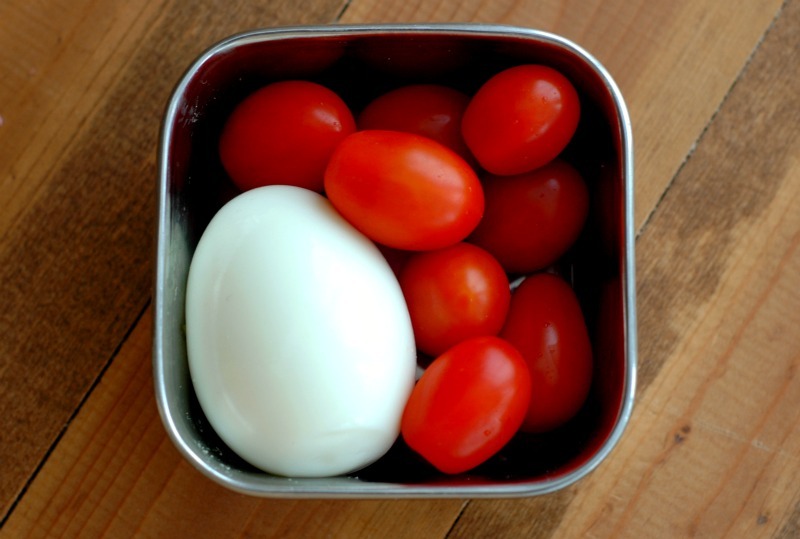 Hard Boiled Egg & Cherry Tomatoes: You can keep a stash of hard boiled eggs for the week in the fridge to pull from quick. This is a favorite of both of my girls! 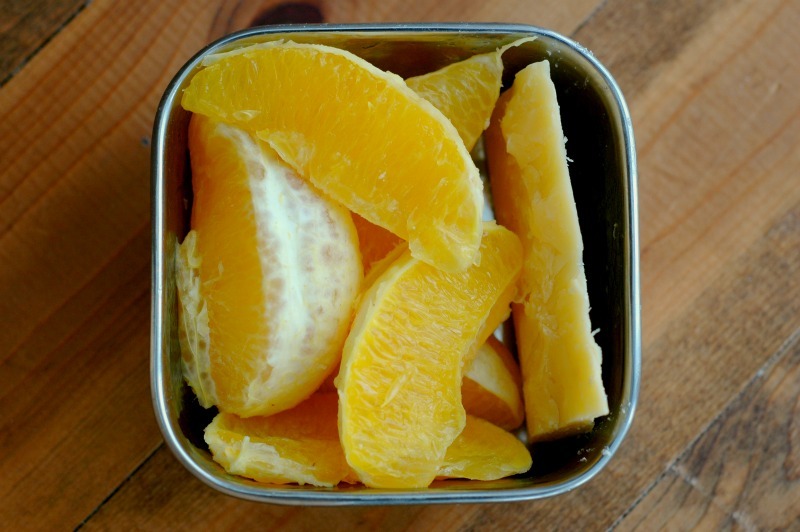 Raw Cheese & Fruit: Some of our favorite fruits for quick packing snacks are orange slices, berries, and grapes. I like to peel oranges or cut anything that needs to be cut because usually snack time is pretty short and little ones don’t have much time to fuss with that. Ok! So hopefully that gets your wheels turning! 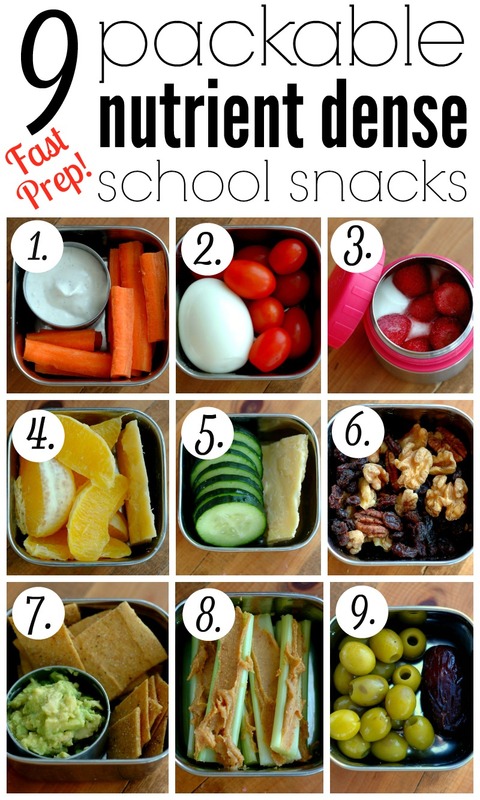 What are some of your favorite preschool and early elementary school snacks to pack? 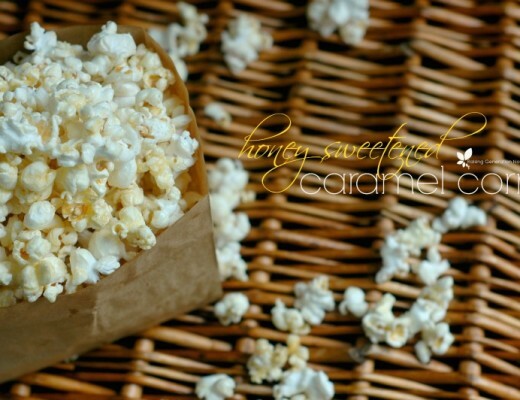 For more real food snack ideas, you can follow my Snack Ideas board on Pinterest! 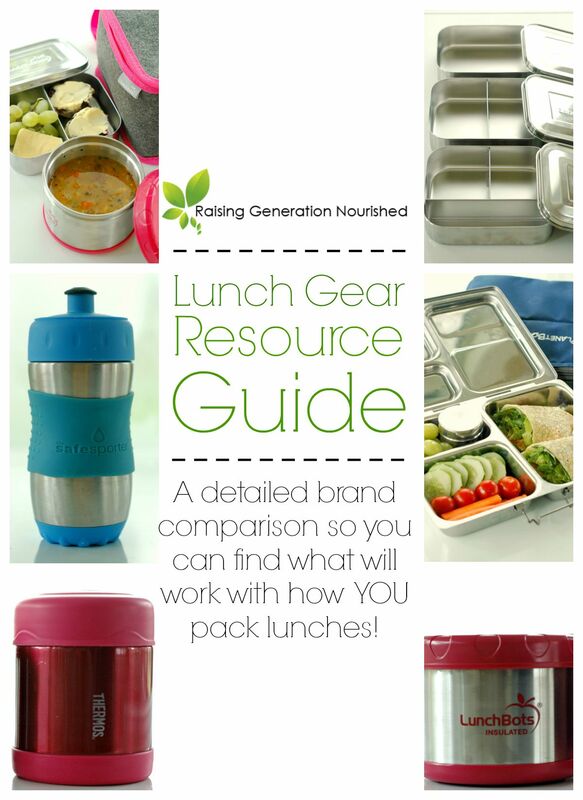 How To Find The Right School Lunch Gear for Your Family! great ideas! I love how quick they are to put together and perfect for little hands. These snacks are good for big people too. Love the plantain cracker idea. Thank you Renée! We homeschool so I never have to pack lunches, but we def still eat snacks and such and I really appreciate you making this visual for us. These ideas will be implemented! ! Great Jessica! We definitely use these at home for the toddler too! Love all of these ideas! My Tiny Love would really enjoy these. She loves olives the way your little one does too. 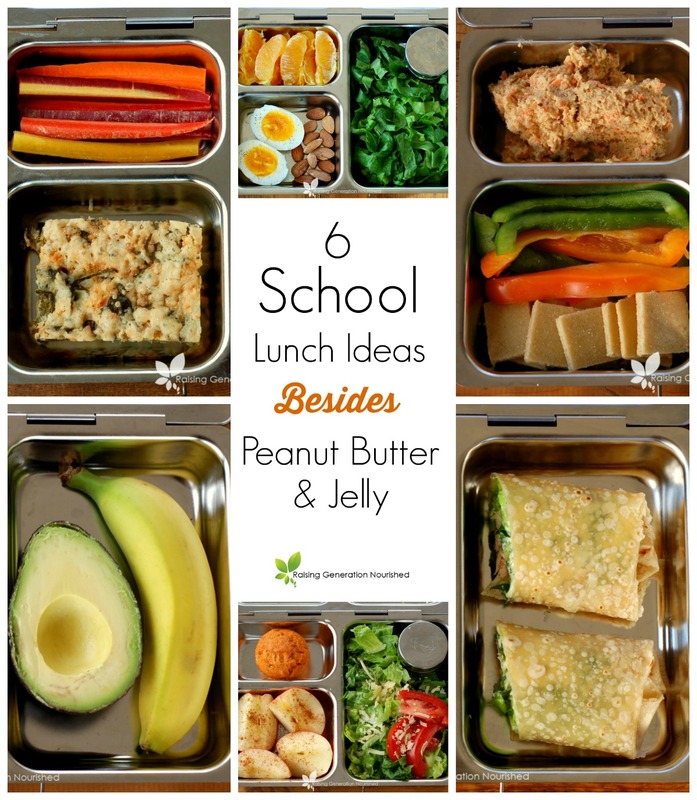 I should have eaten breakfast before reading this post because now I want lunch! Love these ideas! I’m a new mom and am just starting to think about my son’s diet in the “institutional” world at large. 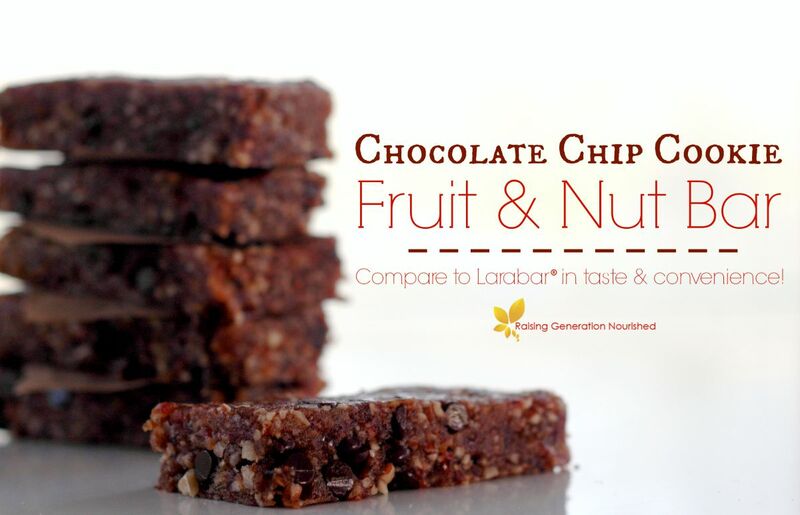 Have your children ever experienced a stigma from having their own snacks? How have they gotten to the point of choosing the nutritious stuff over the “other” that is on offer? love these ideas! Going to share this! This is great! 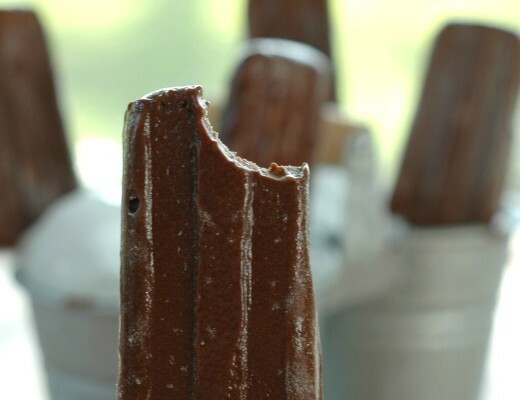 I really get into a snack rut with my 2 year old so there are some great ideas. I’m pinning it. Great ideas Renee! These are the same things I pack in R’s lunch. Sadly A could only eat ONE of them now 🙁 It’s so much harder to find balanced snacks for him with all of his allergies. It stinks not being able to give your kid so many healthy foods. Yes – every bite counts. This is how I like to feed the kids too. Thanks so much for this. Love these ideas! These are great ideas! I do want to point out that coconut is a tree nut and would also need to be avoided if tree nut allergies are a concern. Hi Katherine! Coconut is in the palm family – do you have a source on it being in the tree nut family? I have never read that. Thank you! Can’t wait to try these snack ideas with my family! 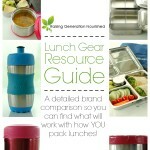 I will be sharing a link to your recipe in my upcoming post, Easy Healthy Lunch Ideas (on a Budget). 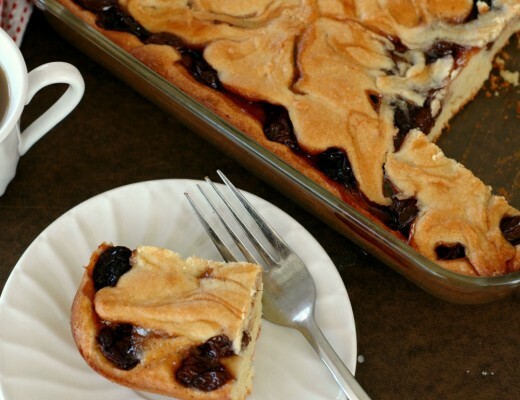 I am sure my readers will love your recipe too! How do you keep these snacks cold when sending them for elementary school? Hi Courtney! Snacktime is usually an hour or so into the school day, so I don’t send them with a cold pack or anything.